BOB BLOG Follow our blog for updates on all the fun we're having at Camp Wayfarer this summer! A somewhat tearful (but exciting!) goodbye in Asheville. And of course, Jim Bob couldn’t resist pretending like he was at Carnegie Hall with the grand piano…. At 12AM, just a few hours after landing in San Diego, Jim Bob stuck his hand in the ocean and was off and running! Only 2,500+ miles to go…. The first couple of days were spent making his way up the mountains to Julian, CA, elevation of 4,226'. Immediately after Julian, Jim Bob descended and began his trek through the desert. The highlight this week was getting stuck in a sandstorm mid-desert with 35-50mph winds. Fortunately, he was able to seek shelter at a small market! The snowplows came out after the storm to move about 2 feet of sand off the highway. Also, you have to love our border patrols! This guy pulled over to offer some water and a ride, which Jim Bob of course had to decline. A highlight of the week was crossing the Colorado River. This meant he had successfully crossed CA and was now entering AZ! Jim Bob also met a nice group of cyclists who were making their own way across the country. They had only left a day later than Jim Bob making his timing FAST compared to them! Go, Jim Bob! Made it to Phoenix! It’s been a great 2 weeks. His feet are a bit sore, but what can you expect?!? Please be sure to leave a message below and we will share with Jim Bob! Big hugs to all and remember, #KeepPounding and #DoSomethingBig. Mary Kenson writing here. As you all may have heard, Jim Bob is back at a cross-country trek this fall attempting to walk/run from San Diego, CA to Atlantic Beach, FL. Your first reaction was/is probably along the lines of "What?! How old is he?! How long is this going to take?! "...Don't worry, ours was the same. As his daughter, I've seen him go from San Francisco to Ponte Vedra Beach via bicycle my senior year of high school in '07, and attempt another bike trek across the country in 2010, my senior year of college. Here I am planning a wedding this year and he's off again! There seems to be a trend of Dad going to do big things on "big" years (25th anniversary summer ring a bell?!). So, here we are! 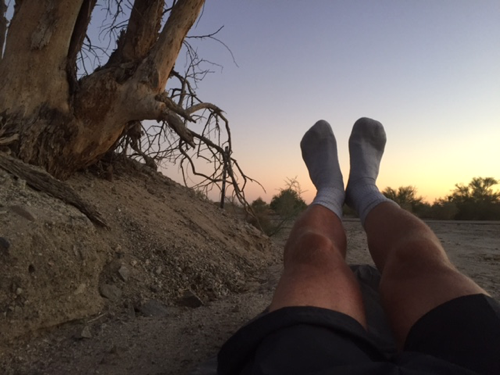 Jim Bob is doing this to attempt a personal life goal before he really ages-out, but also to encourage and inspire our Wayfarer Family to just get outside and DO. Go hard in school, after school activities, community service, simply all aspects of life....Be the best "you", you can possibly be. He is sending loads of cool photos and stories from his adventures each day and we want to pass them along to everyone via the camp website! Stay tuned for weekly updates via the Bob Blog and his Instagram account @wayfaringjimbob. Share your #WayfarerAdventures with us and let us know how you are going out to #DoSomethingBig. Much love to all and happy trails!